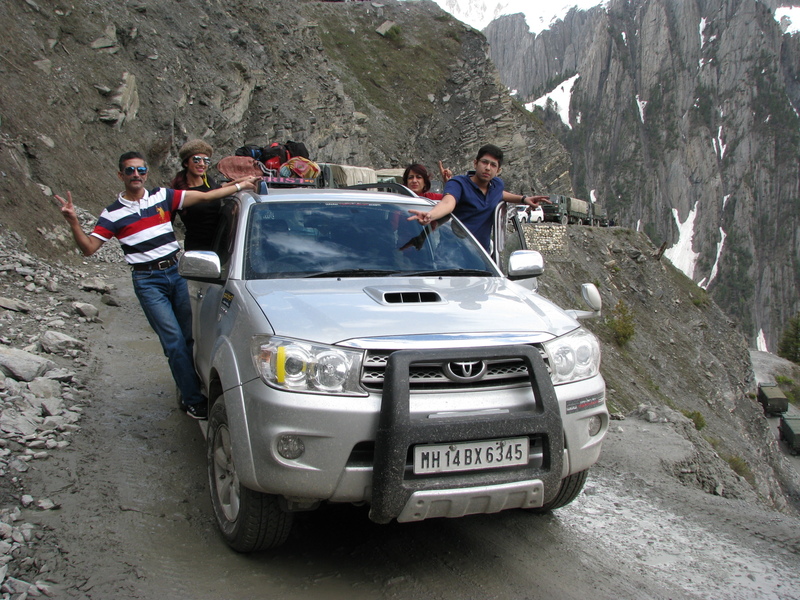 Why a Road Trip to Leh? 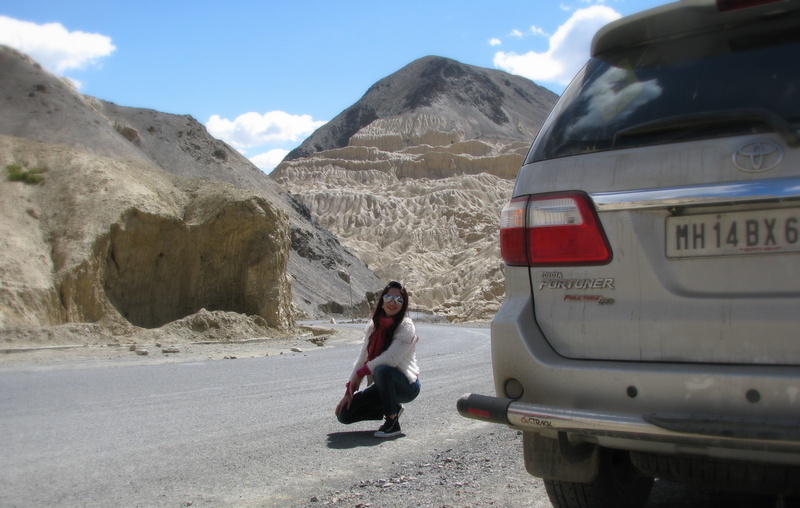 The whole road trip experience is actually the best part about a trip to Leh. During this leg of the journey we halted at Ambala for breakfast & Haveli Dhaba near Jalandhar for lunch (by the way If u wana experience a Dhaba in an upscale way you have to visit the Haveli Dhabas that are on a lot of National Highways in North India) the Lassi was mindblowing (without any doubt, you get the best lassi in punjab ). I suddenly felt all the excitement (which I hadn’t felt with such intensity earlier) of exactly why we had embarked on this journey. Distance of 308 km covered in 11hours approx. 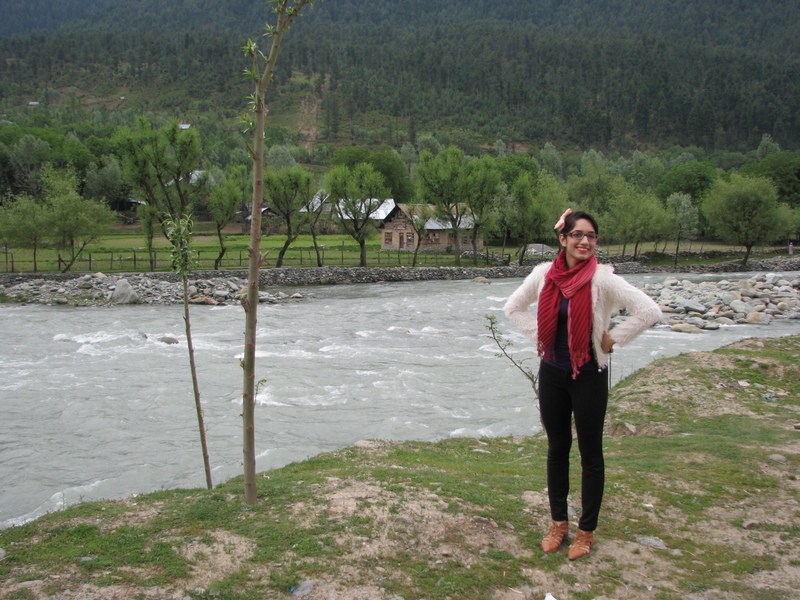 It seemed like a summery day when we left Udhampur but when we stopped for our Tea & Breakfast break after 2.5 hrs of commencing the drive, there was a huge drop in temperature (18°C) which we felt the minute we opened our door. All of us rushed to pull out our jackets. None of us apprehended the oncome of chill on the second day of our trip itself. Post typical hilly region breakfast- Maggi (then legal) we were now enroute Srinagar our lunch hault! 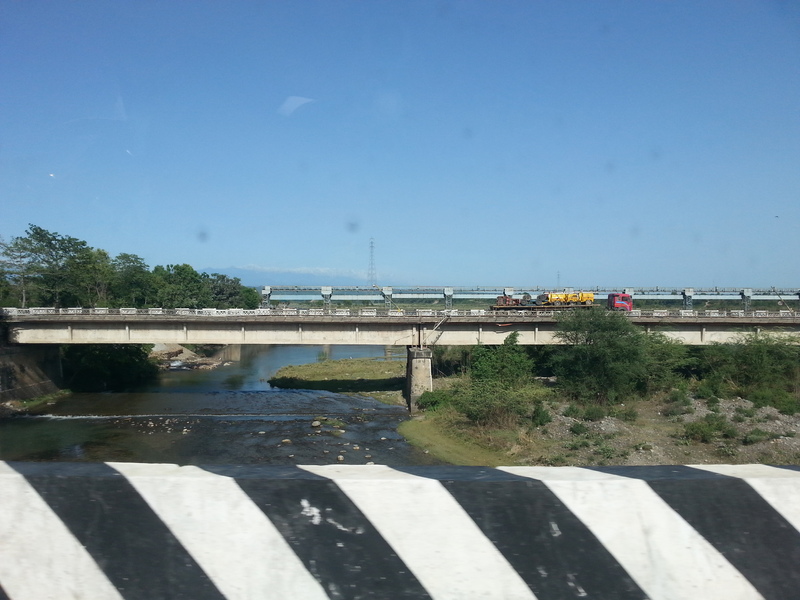 The Mountain drive was being enjoyed with picturesque views of the mountains, streams of water & massive bridges over them. 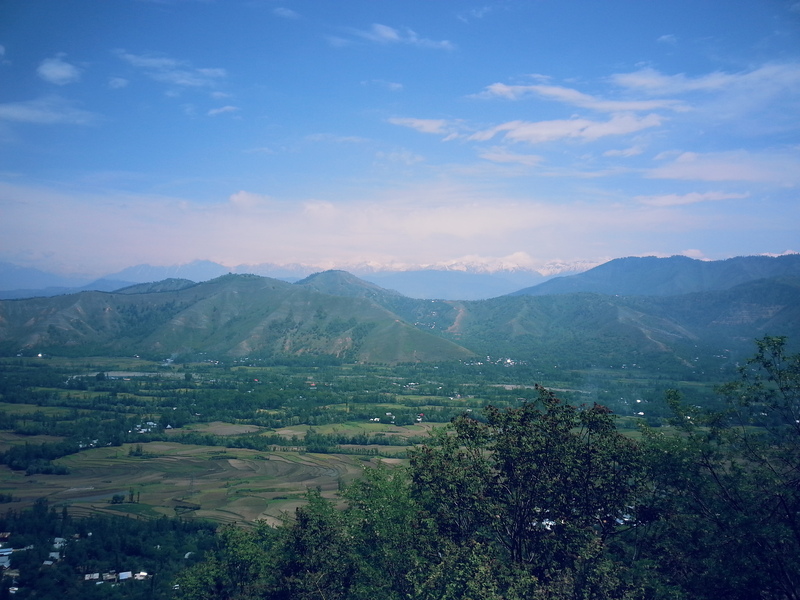 After driving past Rambann we drove through Srinagar & catching glimpses of the beautiful city (promising to enjoy the city on our return journey). Past our lunch time hogged on Shwarmas (although I could barely finish 1 of my own) after which, we were straight on our way to Sonamarg. Once in Sonamarg we stayed at the Army Accommodation (booked in advance through tie-ups in the Army). Post 7pm in Sonamarg it really started to get cold- about 10°C at most. Covered 123 kms in 8hrs approx. The day actually started at 6am although the drive started by 1pm! Why did we waste so much time? 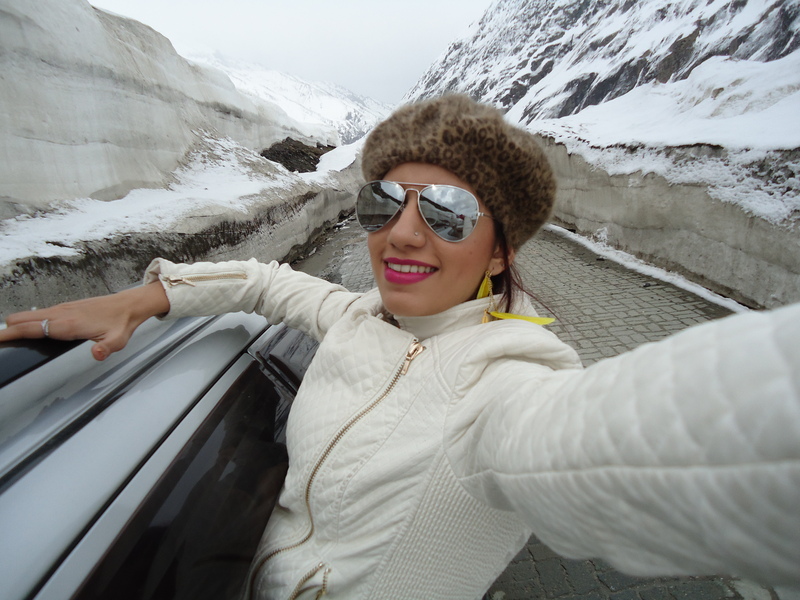 Well so here is the deal- Zojila Pass (11649 ft) is just one lane, fortunately & unfortunately the night before it had just snowed (yes mountain tops were covered in fresh snow & it was a pristine sight to see early in the morning). So roads were being cleared for the traffic to move on safely & smoothly towards Zojila (this is where we say Road trips Cannot Guarantee that you reach the destination preset for a particular day) Meanwhile we bought some authentic Kashmiri embroidered souvenirs for our dear ones back home & then got on our cars into the que from 10am itself. 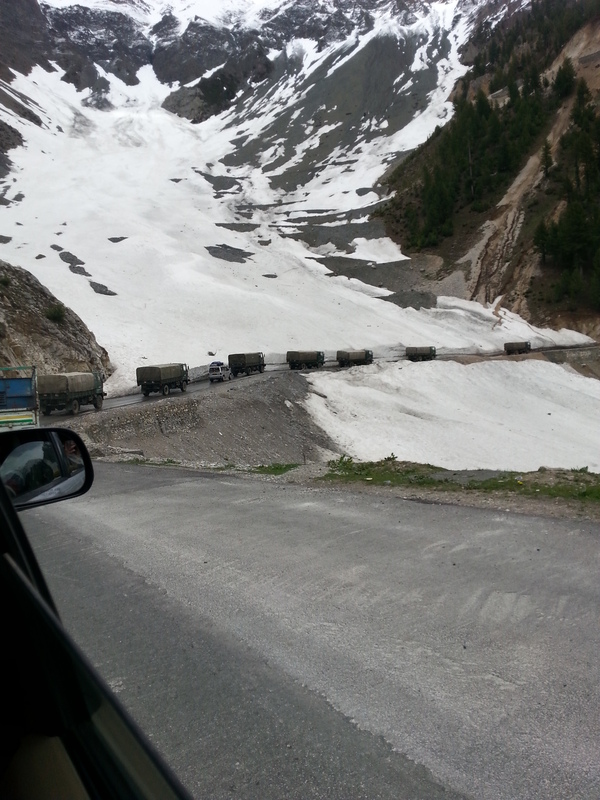 Before the roads opened to all, first the Army Convoy left, truck after truck at regular intervals (Yes! The Army is God there & once you are there you will know why they deserve it!) second went the bikes & then all the public was allowed to leave. 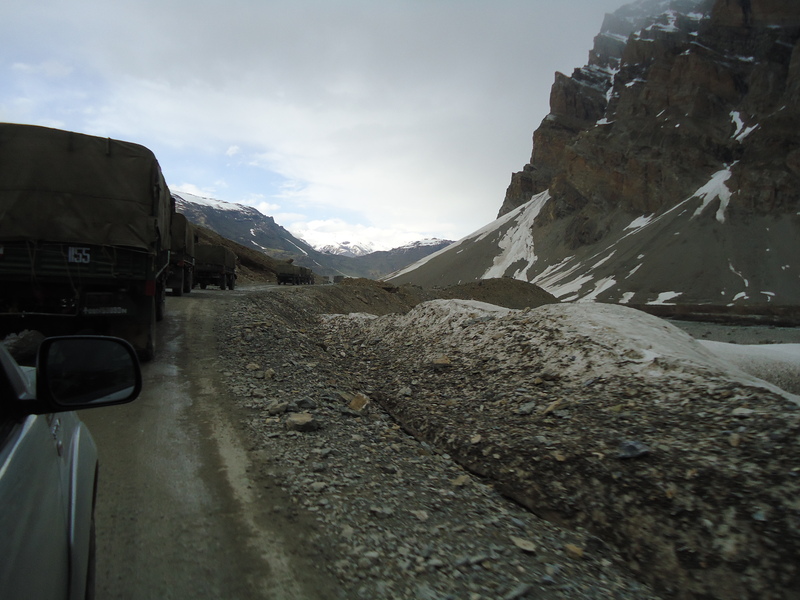 The drive to Zojila Pass is basically walls of snow on either sides (that’s what its famous for) Its a very slow up climb with narrow mountainous road (There is nothing like a tarred road there or maybe it hot washed away) We were especially crawling as we were all lined up behind army trucks. There is absolutely no question of overtaking except some J&K drivers who managed to squeeze beside small cars & literally drive at the edge of the valley. 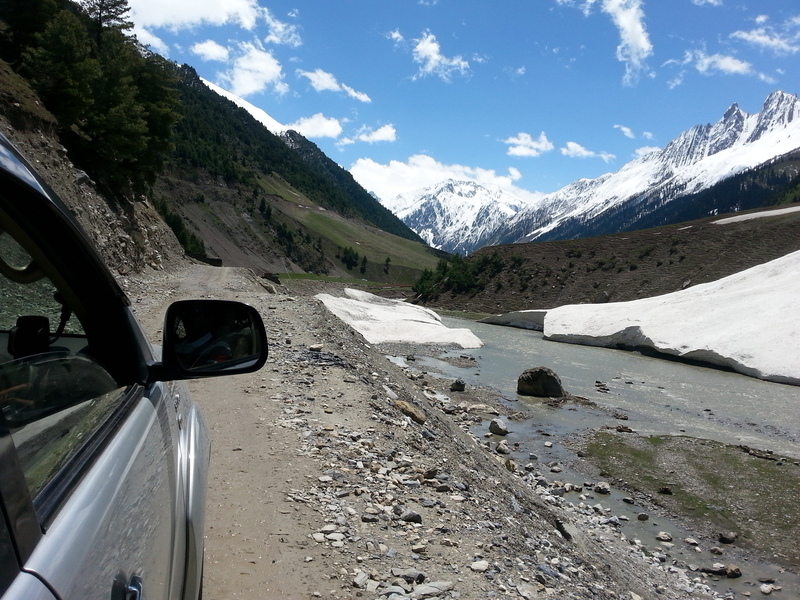 The roads were slushy because of the snow melting, there were patches of snow that we would notice up further on the mountains, which slowly kept growing more profound towards Zojila. See the amount of water & slush! 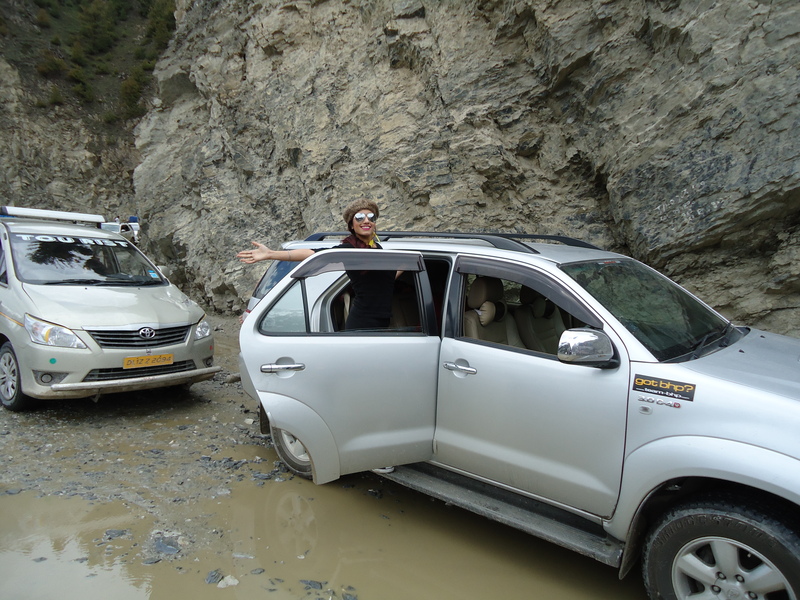 After a lot of false alarms later we Reached the Zojila Pass where there was a clear board mentioning so & there were interlocking tiles on the road too. You arent supposed to really get down there but we quickly did so & took pictures. Beside us there was literally a bed of snow & I wanted to just go & jump on it but contained myself. In a few minutes we even managed ro take a picture with the car between the snow walls. We were actually stopped because the convoy had to get clearance. So this is part of the game once you in the mountains or on a road trip- DELAYS ARE INEVITABLE. We yet continued to drive through walls of snow & slush & it was all just WHITE outside (yet have that sight so fresh in my mind). Slowly the walls of snow vanished & now we could just see frozen lakes; it was like how you must have seen in the movie Haider. 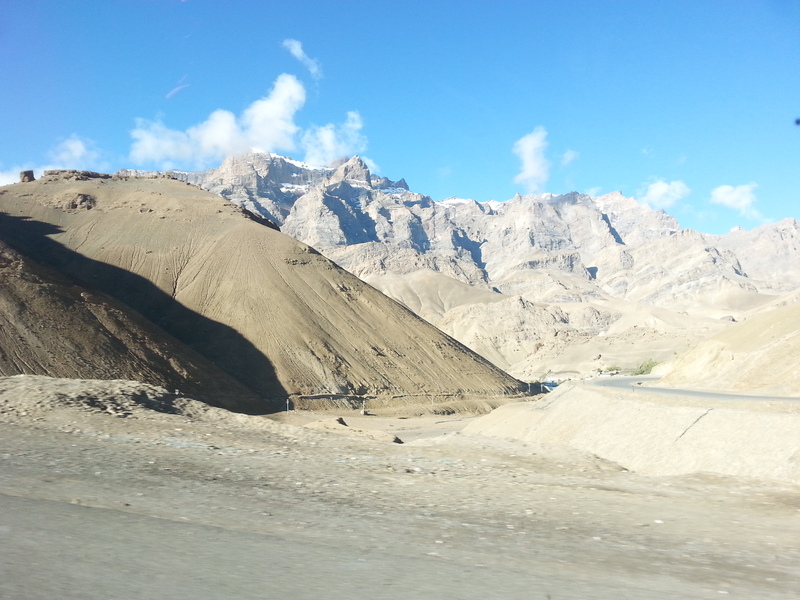 Slowly the topography starts to change & the mountains look bare & have a more earthy colour. Streams of water were flowing on the side of the road. 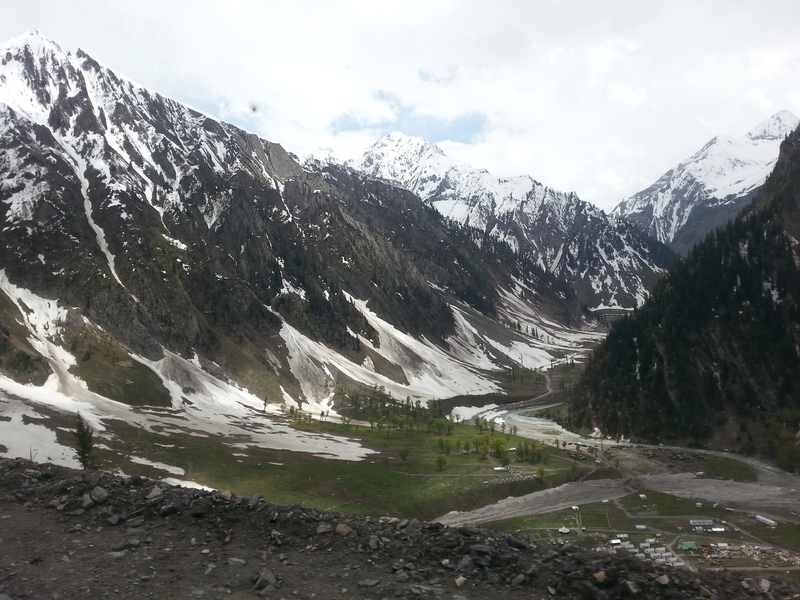 The different scenic views after Zojila were very mesmerising. You knew you were entering a different region as the terrains were changing! 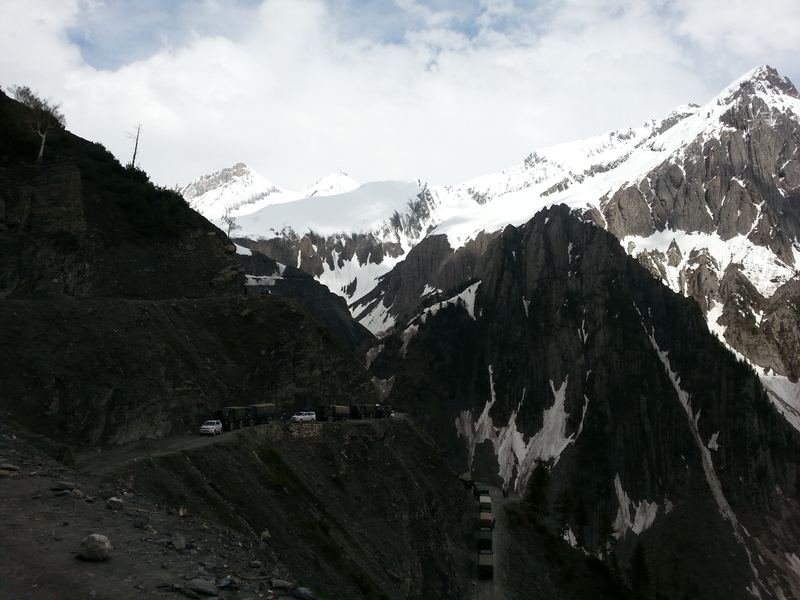 Drass (10,990 ft) one of the main Battle grounds of the Kargil War ’99. We stopped at the Drass market to have some tea & buttered bun (Chai & Bun maska) Butter is a highly consumed food product in the mountainous regions as it provides energy & keeps the body warm! 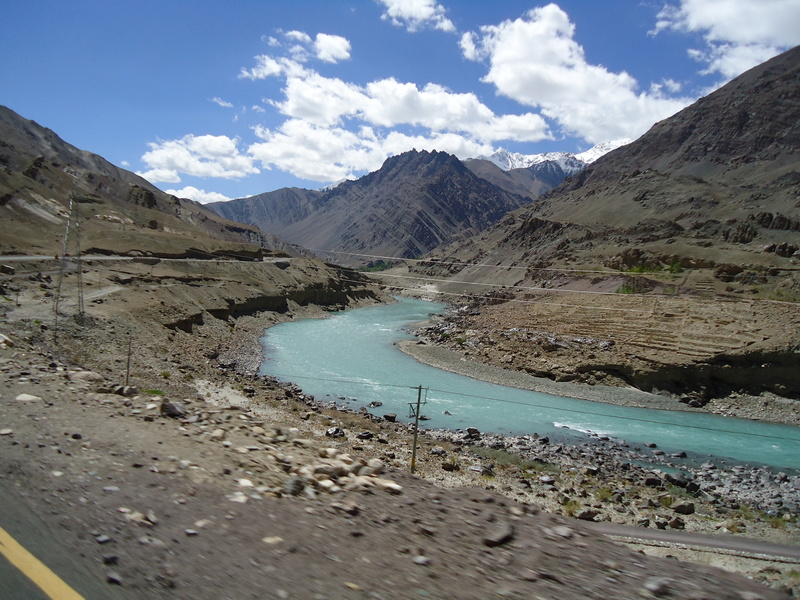 Drass to Kargil was a stupendous drive in terms of the Drive Quality (possibly the best stretch in the whole of our journey) with the roads absolutely smooth, very well marked, sufficient signboards & efficient cat’s eyes. 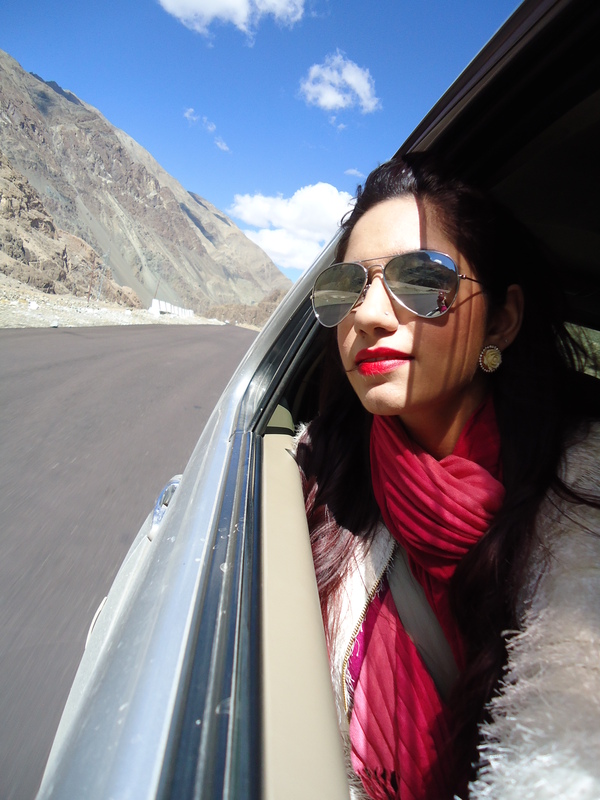 The satisfaction of doing such a splendid drive was what made our day after all the anxiousness & excitement through the day. 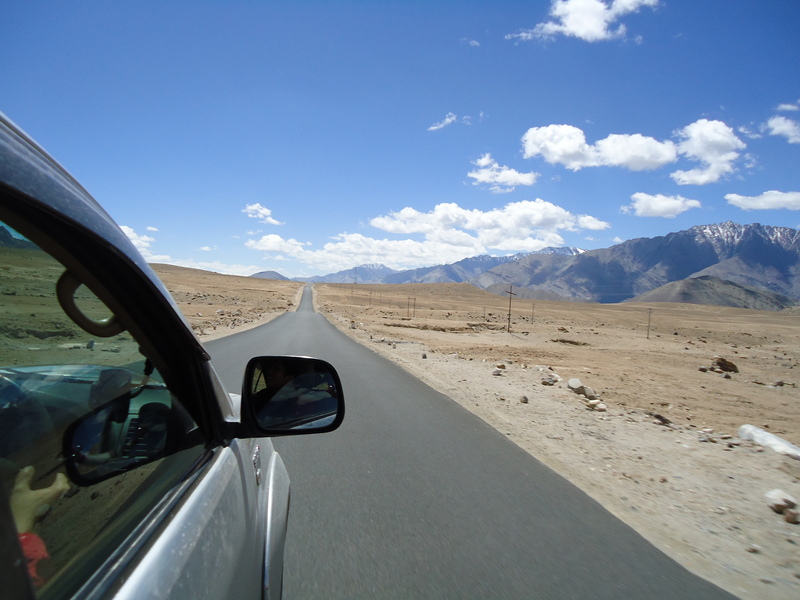 This drive is a crucial drive where you head to the highest altitude in the trip but The Biggest Advantage of a road trip is that you don’t get hit by AMS due to steady acclimatisation. 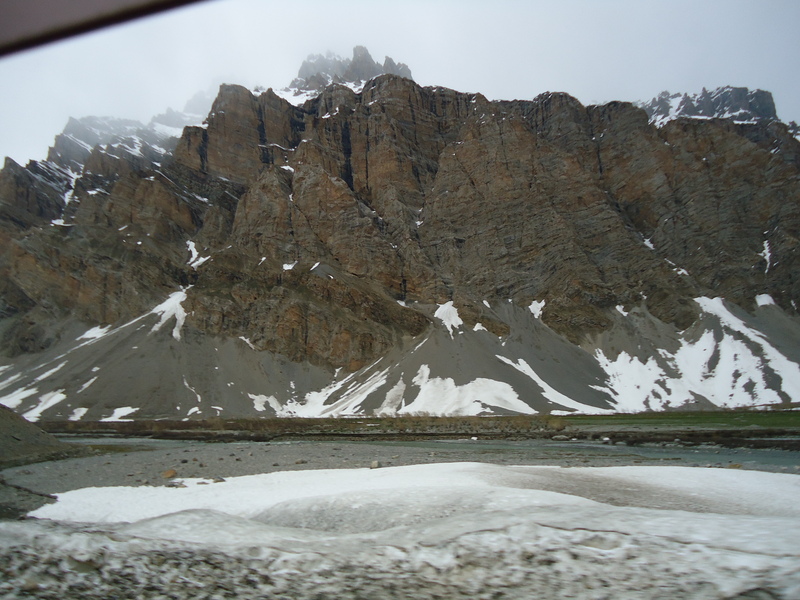 While starting from Kargil at 6 am in the morning it was already 6°C which within 45 mins dropped to about 4°C. The roads were narrow, dusty & stoney. What kept us gripped was the changing landscape with the mountains now more sharp & edgy, making them look like wooden carvings. At some part you would notice Purple streaks in the mountain which meant there was lead content in that part of the soil. 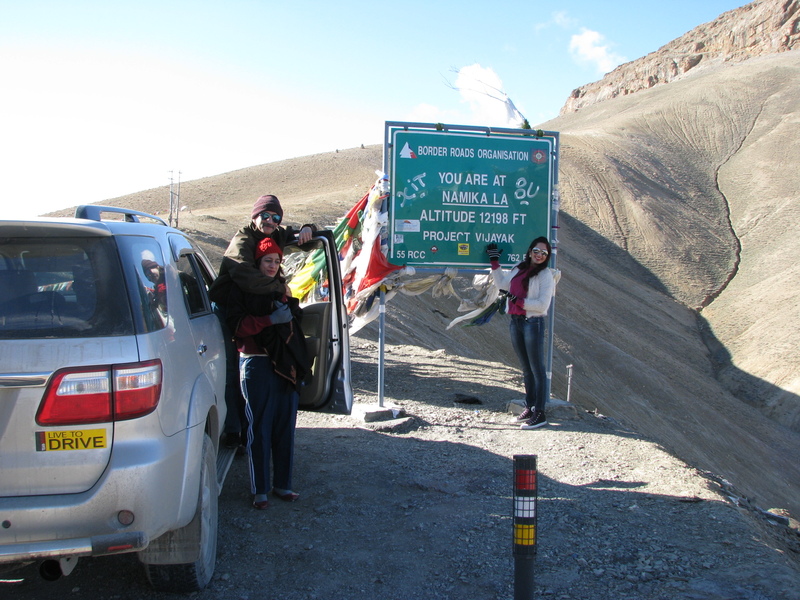 By now we had reached highest point in out journey uptil now on the Leh- Srinagar Highway at 12,198 ft- the Namika La Pass. We were freezing taking pictures there as the wind was flowing with great gusto & nullifying the strong sun rays. 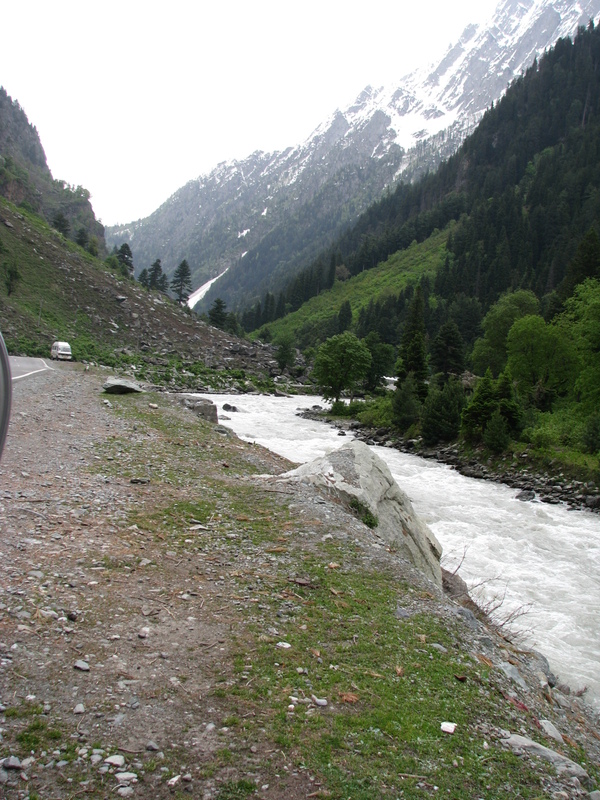 Might I also mention, the roads now were very good (maintained by the Border Roads Organisation). 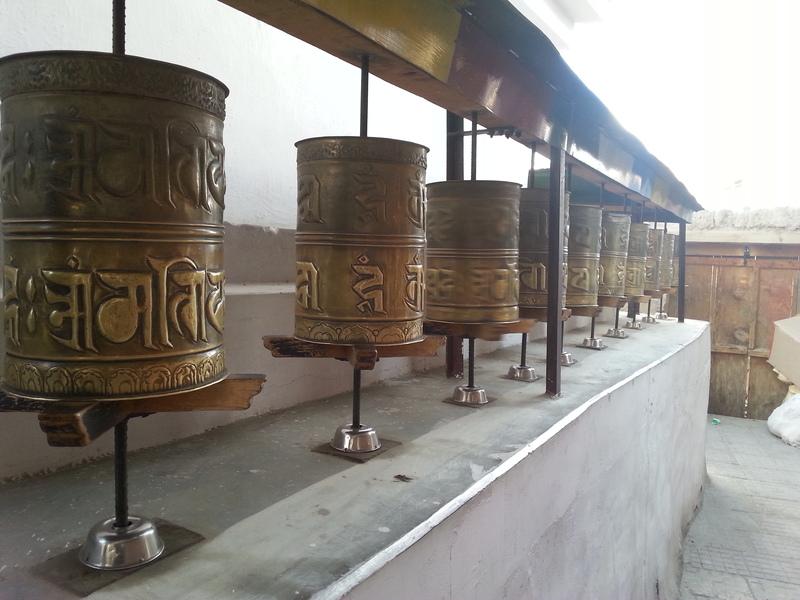 On reaching Lama Yuru village, which has one of the oldest Tibetan Buddhist Monastery in Ladakh about 100kms away from Leh. 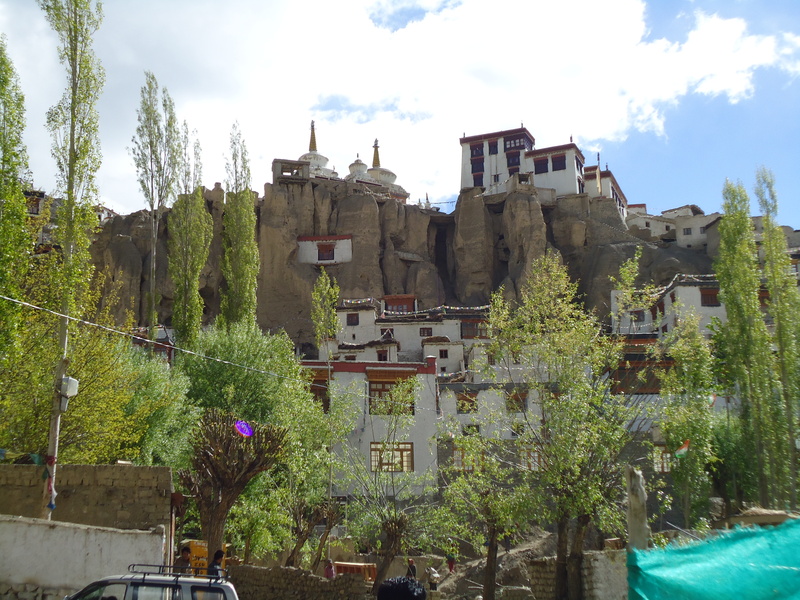 With the way the natives of this village were dressed, it definitely does sink in how close you are to Leh 😀 After our hault for tea we soon saw another attraction of Lama Yuru called the ‘Moonland’ which is a strange but beautiful landscape next to the monastery. Some say the soil here is very similar to that on the moon (hence the name). 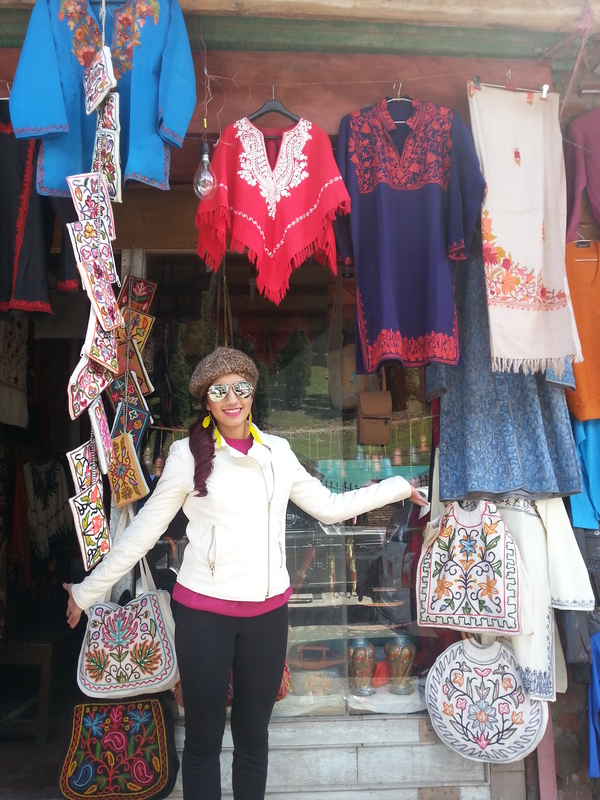 THIS ALL YOU MISS IF U SIMPLY JUST FLY TO LEH! 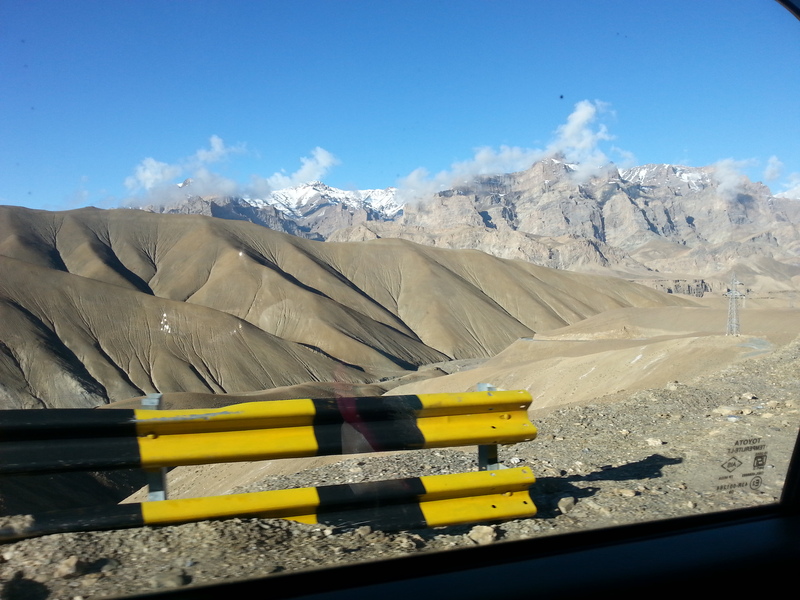 As you get closer to Leh the terrain remained the same but the roads got less winding (relief to the motion sick people). The Pathar Saheb Gurudwara comes on the way after which comes the Magnetic Hill– which we almost missed. I’m sure you want to know If we felt the magnetic pull or not? Well we felt it was a load of Crap! Sorry but we didn’t feel a thing & my dad just to amuse us even took us slightly up the hill (off the road). By the time we reached our accomodation in Leh it was 2pm & by now the sun’s rays were so strong that we had started shedding off the layers we had worn. At 26°C it was warm but once you weren’t in direct sunlight, with the wind blowing it actually was pleasant & you definitely needed a warm jacket. Before this post gets longer I have to force myself to stop 😦 Next week I shall put down the rest of my journey & a lot of Do’s & Dont’s so Stay Tuned 😀 Please do leave in your comments as to how you have liked this post? And if there are anymore details you would like me to provide you with?